Wha the deil hae we got for a King, But a wee, wee German lairdie! A wet sheet and a flowing sea, A wind that follows fast, And fills the white and rustling sail, And bends the gallant mast. Allan Cunningham was born at Keir, near Dalswinton, Dumfriesshire. He was a Scottish poet and author. Cunningham was apprenticed to a stonemason, but gave his leisure to reading and writing imitations of old Scottish ballads. In 1810 Cunningham went to London, where he worked as a parliamentary reporter and journalist till 1814, when he became clerk of the works in the studio of the sculptor, Francis Chantrey, a post he kept until Chantrey's death in 1841. Cunningham meanwhile continued to write, three novels, a life of Sir David Wilkie, and Lives of Eminent British Painters, Sculptors, and Architects, besides many songs. 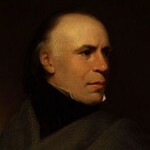 A Wet Sheet and a Flowing Sea is one of the best British sea-songs, although written by a landsman; and many other of Cunningham's songs became popular.